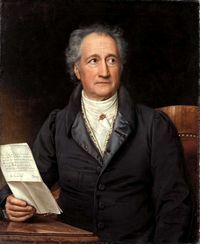 Goethe on Wonder | eWakening now! « Olympics for the Brain at U.N. The highest to which man can attain, is wonder: and if the prime phenomenon makes him wonder, let him be content; nothing higher can it give him, and nothing further should he seek for behind it; here is the limit. This entry was posted on August 12, 2008 at 5:04 pm and is filed under Uncategorized. You can follow any responses to this entry through the RSS 2.0 feed. You can leave a response, or trackback from your own site.